"There's a Starman, waiting in the sky." Beloved musician and actor David Bowie, who passed away on January 10 after an 18 month battle with cancer, has been honored with a lightning bolt shaped constellation. 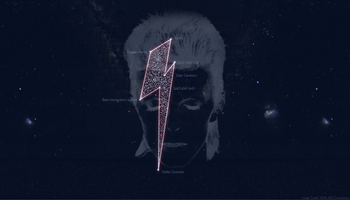 The constellation, which resembles the iconic lightning bolt from the cover of Bowie's Aladdin Sane album, is located near Mars, and is the result of a partnership between Belgian radio station Studio Brussel and MIRA Public Observatory. "It was not easy to determine the appropriate stars," said Philippe Mollet of MIRA. "Studio Brussels asked us to give Bowie a unique place in the galaxy. Referring to his various albums, we chose seven stars - Sigma Librae, Spica, Alpha Virginis, Zeta Centauri, SAA 204 132, and the Beta Sigma Octantis Trianguli Australis - in the vicinity of Mars. The constellation is a copy of the iconic Bowie lightning and was recorded at the exact time of his death." Fans can add their favorite songs, quotes, and lyrics on a Google Sky digitization of the constellation here. Last week Square Enix began offering fans a free digital copy of the 1999 game Omikron: The Nomad Soul, which features Bowie in a starring role.